Having worked with sprinters and speed athletes for most of my life, I am always fascinated at how making an athlete faster can benefit them in many ways. One of the key concepts passed on to me by Charlie Francis was the concept of “Speed Reserve”. 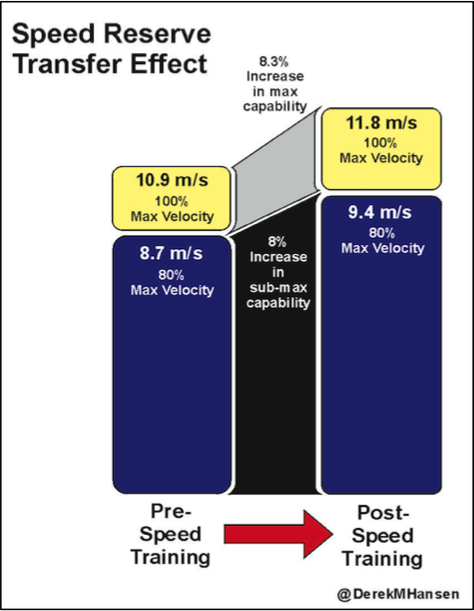 By training an athlete to be faster, you can increase his or her abilities not only in the max acceleration and max speed realm, but also for all of the sub-max speed activities that occur in the spectrum below max performance abilities. 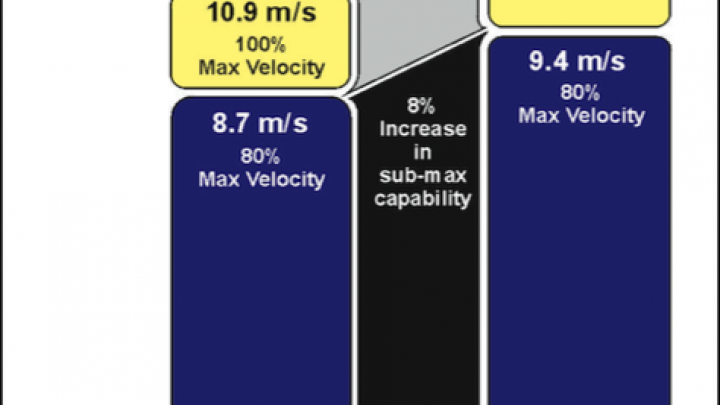 As illustrated in the diagram below, if you can increase an athlete’s max acceleration and speed, all of that athlete’s sub-max capabilities will be elevated as well. Thus, an athlete that runs a 40-yard dash in 4.3 seconds will find it very easy to cruise around the field at a velocity equivalent to a 4.7-second 40-yard dash. A good example of the concept of speed reserve is demonstrated every four years in the Summer Olympic Games, where the favorites in the 100m dash run through the qualifying rounds at a sub-max intensity, advancing to the next round with a good deal of fuel left in the tank. In order to be in contention for a medal in the 100 meters, you must first have the max speed capabilities in place to run through the heats at a relatively pedestrian pace. An athlete, who hopes to ultimately win the 100m final in under 9.70 seconds, can easily qualify by running around 10.10 seconds in the opening round, 10.00 in the quarter finals and anywhere between 9.90 and 10.00 seconds in the semi-final rounds. This would roughly be equivalent to running at 95.0 to 97.5% of this athlete’s max abilities. While such performances may still appear to be incredibly fast, it is profoundly less stressful to a well-seasoned sprinter poised to challenge for an Olympic gold medal. Athletes that do not adhere to this progression and are forced to run at 100% of their abilities in any of the qualifying rounds will likely run a disappointing race in the finals. An athlete who has exceptional max sprint capabilities can still operate at very high speeds during a match or game and not fatigue, since most team sports operate at much slower speeds as proven by GPS technology. Thus, an athlete that is well trained from a sprinting perspective will always demonstrate exceptional repeated sprint abilities throughout a practice or competition session. Athletes that only practice at “practice-speed” will find that they will never reach their speed potential, and may be at higher risk for a hamstring strain when they are required to sprint at max capabilities, especially for repeated efforts. I often hear strength and conditioning coaches talk about how they don’t want to train their athletes like Track and Field sprinters. One of my former interns informed me that some coaches actually pride themselves as not being slaves to the technical requirements of elite sprint mechanics for their team sport athletes. “We’re not training sprinters here!” When I hear such comments, I’m deeply disappointed. While I agree that sprinters do not automatically make great team sport athletes, this has more to do with their training commitments, emphasis and focus, not the potential of track sprinting to enhance the abilities of team sport athletes. 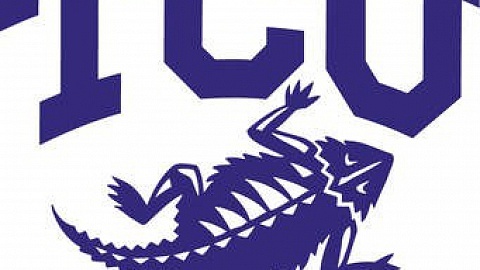 In fact, many top athletes in sports such as football, baseball and soccer initially had successful careers in Track and Field events – usually in high school – until they made the decision to specialize on just one sport. This was illustrated in an article I wrote a number of years ago about the vast number of world-class high hurdlers who had successful careers in the NFL. Simply assuming that track sprinters would be great multi-sport athletes is as naïve as believing that Olympic weightlifters would transition smoothly into high level mixed martial arts competitions because of their speed, strength, skill and flexibility. It just doesn’t work that way. Optimal sprint training adaptations and technique can be developed concurrently with appropriate team sport skills and abilities. When you spend the time required to develop advanced linear sprint performance in an athlete, including starting strength, acceleration and max velocity abilities, you enhance that athlete’s performance capabilities in the most efficient and least damaging manner. Coaches often say that “direction change” and “agility” work are much more sport-specific for team sport athletes than linear sprint training. While this may be true in some respects, the volume of high-quality, high-velocity work performed in agility training cannot come close to what can be covered in linear sprinting. And I would argue that most of the agility work, although very stressful on the muscles, joints, tendons and ligaments of the athletes, would be performed primarily at sub-maximal velocities. 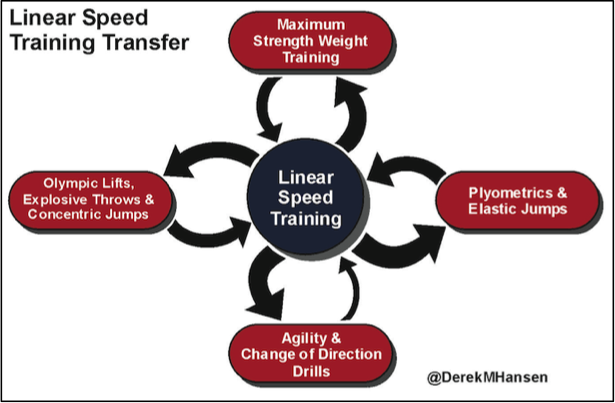 The real deal-breaker for me with a speed-reserve approach is that the benefits of max sprint training can feed back into all sub-max speed and power abilities, but the same cannot be said for the opposite direction. We all know that exceptional sprint ability comes from an athlete’s ability to put significant vertical force into the ground. If you train an athlete in linear sprinting and his or her sprint times improve, you can be absolutely certain, barring an illegal tailwind, that this athlete has improved the ability to put vertical force into the ground. This ability can transfer to jumping, deceleration, direction change and other agility movements; however, the transfer back is not as great as illustrated in the diagram below. Call it central nervous system adaptation, enhanced recruitment efficiency or simply “rocket fuel”; I know that when I make an athlete faster in a linear sprint, other athletic qualities improve in parallel. Again, you will hear the naysayers claiming that linear sprint training is for track athletes and not for team sport athletes. All well-designed programs for team sports that require running should include an appropriate amount of linear sprint work. 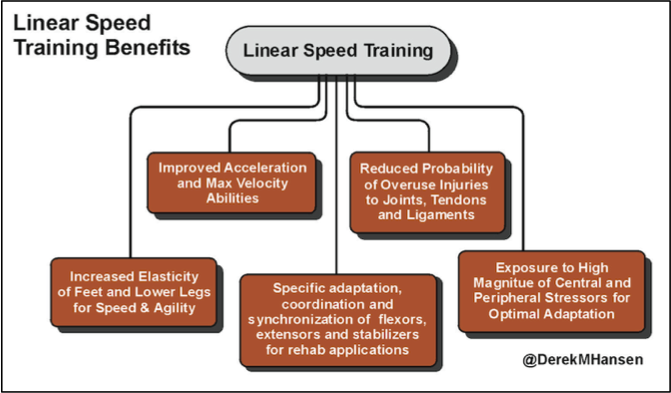 Are we only going to only include linear sprinting as part of the speed and movement training program? Absolutely not! But when incorporating linear sprint training into the program, good coaches should adhere to the sprint programming and mechanics developed over the last 100 years with sprinters. I also believe that many strength and conditioning coaches over-emphasize the need for agility training, above and beyond the need for linear sprint training. In watching the recent World Cup, I am pleasantly surprised by how much linear acceleration and sprint abilities allow players to break into open space and create mismatches and scoring opportunities. Players who dart around back-and-forth welcome defensive players to converge on them and squander any chance of making a play. The same goes for American football. While I’m not disregarding the contribution of change-of-direction work and movement coordination, I am pleading to coaches to recognize the benefits of training people to accelerate and sprint in a straight line – also known as the shortest distance between two points. We should also not discount the value of actual sport-specific practice and game play to contribute to an athlete’s specific movement skills, particularly as the amount of work prescribed in these realms can be high. The volume of work performed in practice should be factored into the overall planning of training elements and relative volumes and proportions of work at varying intensities. Running around cones, shuttling back and forth, and tip-toeing through a speed ladder should not characterized as sport-specific high-velocity work, but perhaps should be classified as a non-specific combination of strength, power, elastic and strength endurance work depending on the intensities and recovery times assigned. In a time when technical innovation, spreadsheets, databases and complex explanations reign supreme, sticking with simple methods that have a proven track record should not be underestimated. Athletes that follow an effective linear-based sprint program within their comprehensive training plan will always have great results. Sprinters make lousy baseball players because they spend all their time sprinting, not playing baseball. So don’t miss the forest from the trees. Good baseball players who sprint as part of their training will be better and healthier than good baseball players who don’t. I’m hoping that as coaches we don’t forget the value of this simple training method.